Mom's Gone Bronson! 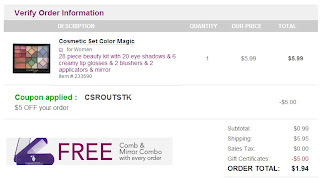 : How to Score a $15 Palette for JUST $1.94 with Crowdtap and Fragrance.net! How to Score a $15 Palette for JUST $1.94 with Crowdtap and Fragrance.net! If you are a member of Crowdtap, you may recently have been given a choice of free gift in the form of a gift card, via your email! I know a few people have been wondering which one might be the best value, or the deepest discount or the wisest choice and, to be honest I am not 100% sure, BUT! Sometimes it pays to choose one of the lower valued cards as apposed to the higher value as some do come with a clause like $10 off is really $10 off of a $50 purchase, and I know a lot of folk won't have that money to spend, SO! Here is the deal I got, with the card that I chose from Fragrance.net! (Thank you, Crowdtap!). I clicked on the link in the email that I received for my "free gift" and then headed on over to select the $5 off of any $5 or more purchase at Fragrance.net. This does exactly what it says on the tin and doesn't require a hefty purchase to use this gift card! 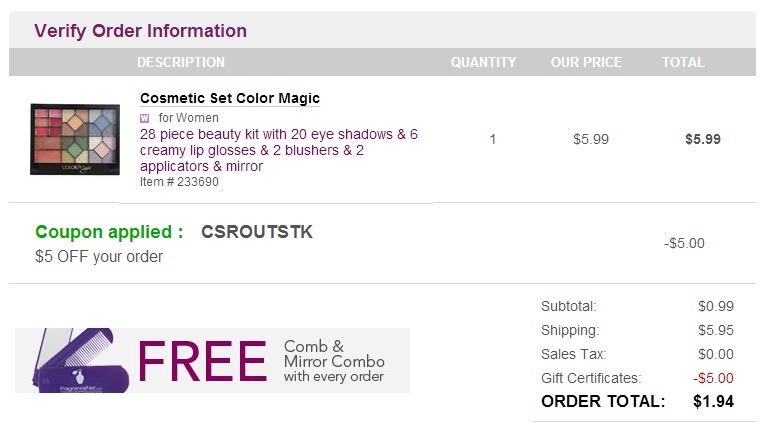 I picked up 1 Color Magic Cosmetics Set for $5.99, which is down from $15.00 on sale right now! I put this in my cart and held on to my gift card - do not enter it yet! Instead of using your $5 gift card right away, enter coupon code "CSROUTSTK" into the coupon code box at the bottom left of the screen! This will give you $5 off of your order (no minimum required), which will bring your order total to 99 cents (before tax) and then you'll proceed to shipping options! When you get to shipping options, choose standard shipping, which is $5.95! This will bring your order total to $6.94 and this is then when you can enter your Fragrance.net gift card from Crowdtap! In the same box you used to enter your previous coupon code, copy and paste the gift card code that you received from Crowdtap (go back through the link in your original email if you can't find the gift card once you have selected it) and you will have $5.00 taken off of your outstanding total (including shipping), which then takes your out of pocket cost down to just $1.94! Not bad for a $15 palette, even if I do say so myself! AND a bonus with this order is that you should also receive a FREE comb and mirror, as you do with every Fragrance.net order! Wonderful and shipped right to your door! Let me know if you get one, or any other deal you might find along the way! Disclaimer: I am in no way associated with Crowdtap or Fragrance.net and their promotions other than being a member of the Crowdtap site. I am not being paid for this post. All coupon codes used are active as of 12:30pm 5/3/12, which may be subject to change at any time! Thank you! GREAT deal! Thank you for sharing!! Going to get one to add to my gift stash!